The journey to Des Moines. Crossing the state line from Missouri. 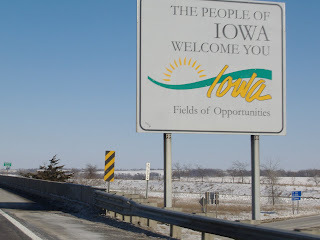 Iowa seems like a friendly place already. A BIG shout out to the movers. 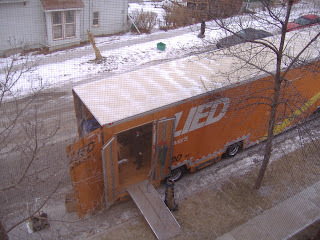 Maybe you have wondered if hiring movers is really worth it. Take my word... worth every penny. Granted, Jason's company paid for it, but we have already decided that it is a worthy investment. They packed all of our things in 3 hours, loaded them, delivered them to Des Moines, and carried them up three flights of stairs. Priceless. We have already started saving for the next move, just in case someone else doesn't pick up the tab for that one. 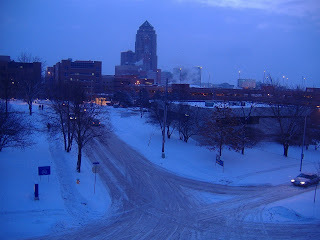 This is our view of downtown Des Moines. And a lovely view of the snow. I'll post more pics of the house as it develops. Iowans are good people. I should know: I'm related to most of them :) Congratulations on all things new in your life!